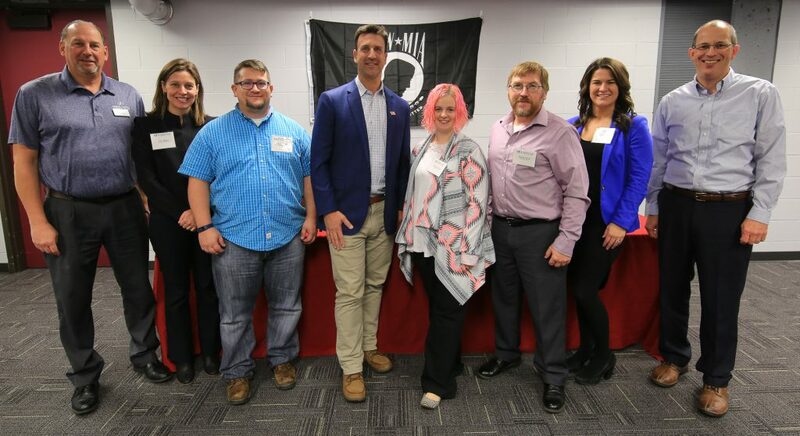 Dakota County Technical College has shown its commitment to being a veteran friendly campus by being proclaimed a Beyond The Yellow Ribbon Company in 2010, opening a newly remodeled Military and Veterans Service Center in 2016, and being ranked #6 in the 2018-2019 school year on the list for Military Times Best: Career & Technical Colleges. Apply for financial aid by completing the Free Application for Federal Student Aid (FAFSA) at www.fafsa.gov. * Note: Eligible persons are reminded that the U.S. Department of Veterans Affairs will not pay benefits for repeated or audited courses. In addition, benefits for short courses—those that do not meet for the entire term—will be paid for only the days that the class meets. Verify Enrollment with college certifying official. All Chapter 1606 and Chapter 30 beneficiaries must verify their enrollment on a monthly basis, on or after the last day of the month. If you have a change in enrollment that impacts your status (for example dropping from full time to 3/4 time), you must also notify the School Certifying Official. Click here to complete your monthly enrollment verification, or call 1-877-823-2378. Follow courses that are within your major. If you change your major inform the VA Certifying official. Report your registration, changes, or withdrawals to School Certifying Official. Monthly verify your attendance to the VA on the WAVE, (presently CH 33 is exempt from monthly verification) WAVE call in number 1-877-823-2378. Any questions or concerns please contact the Regional Coordinator or School Certifying official. View the Guide to the Evaluations of Education Experiences in the Armed Services to see which military courses may equate to college credits. What are general options for prior learning assessment (PLA) or credit for prior learning (CPL)? Established in spring 2007 in cooperation with the Minnesota Department of Veterans Affairs, The Military and Veteran Service Center provides support to military members, veterans, and their families as they transition to college and beyond. The Center is committed to offering information and assistance as well as a welcoming space for students to gather for peer support. The Center is located in Room 2-302 and is staffed by Katherine Bachman and VA student workers who are committed to helping veterans reach their higher education goals. Listed below are resources on campus that can be beneficial to veterans. A one-stop resource for information and referrals regarding veteran’s benefits and rights. Veterans can register for classes during pre-advising week earlier than the general student population. DCTC has two reserved parking spaces in each parking lot for veterans and current military. When requesting a transcript in person, bring your military ID, DD214, or VAMC ID card to have the transcript request fee waived (the fee will be charged for online requests through the National Clearing House). DCTC's automotive programs work periodically on "live" vehicles for the public. Assists students and alumni to develop, evaluate, and implement their career plans. Provides tutoring, testing, study and success planning to help students complete what they have started. Provides accommodations and assistance to ensure equal access and opportunity for students with disabilities. In addition to Veterans Education Benefits, veterans may apply for federal and state student financial aid. The Mobile Pantry and Lunch Box are free for any DCTC student in need of food support. A licensed practical nurse provides initial assessment and treatment of injuries and illnesses on campus. DCTC is a stop on MVTA’s Route 420, which connects directly to Rosemount and the Apple Valley Transit Center, offering multiple connection points. DCTC offers a wide variety of scholarships, including those that are military and dependent specific. Provides listening sessions, identifies barriers, coordinate resources and assists students to develop a success plan to overcome those barriers. A college retention program with the goal of helping students navigate the college experience from acceptance to graduation or transfer to a four-year college. Listed below are resources off campus in Dakota County that can be beneficial to veterans. The Veterans Crisis Line connects Veterans in crisis and their families and friends with qualified, caring responders through a confidential toll-free hotline, online chat, or text. Veterans and their loved ones can call 1-800-273-8255 and Press 1, chat online, or send a text message to 838255 to receive confidential support 24 hours a day, 7 days a week, 365 days a year. Offers wide ranging assistance and advocacy for veterans and their families, including disability claims, medical benefits, discharge upgrades, and more. Assist with employment issues, including job search, resume writing, and access to unemployment benefits. Low or no cost health care for all veterans. Provides assistance to positively motivated local veterans and their families who are homeless or experiencing other life crises. A free referral hot-line with live chat regarding military benefits. A mental wellness resource for service members, veterans, and military families. A comprehensive network that supports service members and military families. Information on military legal issues or pay, TRICARE benefits, and referrals for home maintenance. Disabled veterans ride free by showing a Veteran's Identification Card issued by the Dept. of Veterans Affairs with the words "Service Connected" or "SC" below the photo. 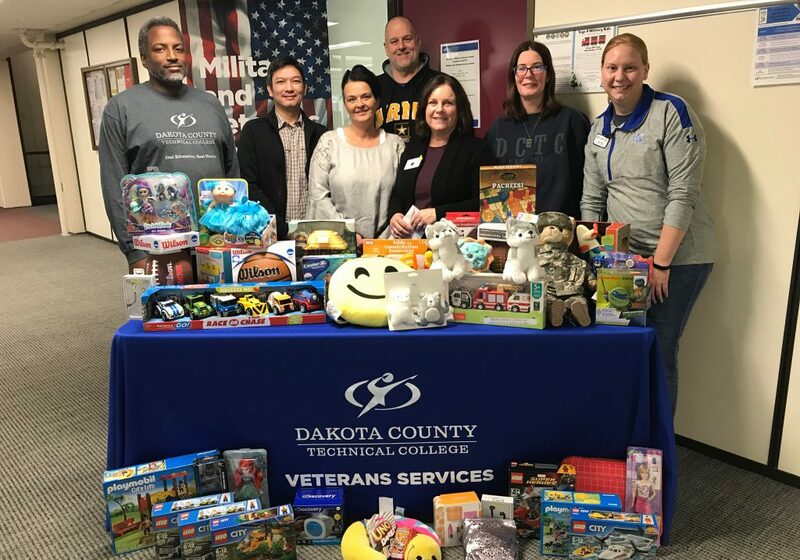 The mission of the Dakota County Technical College Beyond the Yellow Ribbon Committee is to support student-veterans, service members and their families; honor their service; and advocate for military-friendly policies and practices. Support the retention and academic success, wellbeing, and career success of student-veterans, service members, and their families. Increase campus awareness of veterans’ challenges, military culture, and best practices to support the military community. Advocate for military-friendly policies and practices. Honor and recognize the service and sacrifices of veterans, service members, and their families. Track effectiveness and success of military-related initiatives and continuously improve services to student-veterans, service members, and their families. Collaborate with Beyond the Yellow Ribbon networks, government agencies, community partners, and non-profit organizations. DCTC is proud to recognize the following employees for their military service. The following military-friendly policies reflect the spirit of the Beyond the Yellow Ribbon Company Status awarded to Minnesota State and Dakota County Technical College. Consistent with Minnesota State Statute 197.775, students who are eligible and have applied for but not yet received veterans benefits are exempt from being charged a late fee. The law says: "A state college or university may not assess late fees or other late charges for veterans who are eligible to receive federal or state educational assistance and who have applied for that assistance but not yet received it, nor may they prevent these students from registering for a subsequent term because of outstanding tuition charges that arise from delayed federal or state payments." View all veterans-friendly Minnesota State policies. 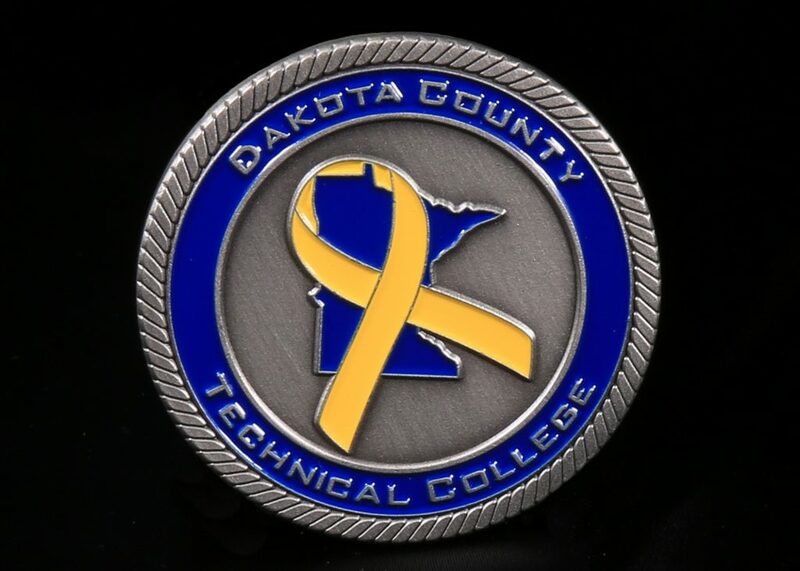 Challenge coins are awarded to employees who are veterans, and veterans, service members, and their dependents utilizing military benefits upon the completion of a degree or diploma at Dakota County Technical College. Additionally, through a rigorous nomination process, challenge coins may be awarded to employees who have demonstrated outstanding support of students in the military community. Download the form below to nominate a employee! The following individuals have been awarded a challenge coin by the DCTC Beyond the Yellow Ribbon Committee for their outstanding support for the military community. Kathy served in the U.S. Navy, her husband served in the U.S. Army Reserve and as a U.S. Navy Seabee, she has a son who is currently serving in the U.S. Navy and a daughter currently serving in the U.S. Air Force Reserve. Kathy has worked in Veterans Affairs for 11 years, dedicating her career to supporting our military community. Kathy supports the success and well-being of veterans through her role on campus managing the Military and Veterans Service Center, ensuring the space is warm, welcoming, and meets the needs of our student-veterans. Kathy was instrumental in securing funding for the current Military and Veterans Service Center. When Kathy learns of needs that veterans have, she utilizes her support network to meet the need. One example of this is when a student-veteran needed living room furniture and Kathy was able to find someone who had furniture that needed a new home through her network. Meeting this need helped the veteran’s wellbeing and financial stability. Michael served in the U.S. Marine Corps and has a son currently serving in the U.S. Air Force. Michael works tirelessly to support the retention and academic success of all Dakota County Technical College students, and places special emphasis on students with a history of military service. Michael goes out of his way to engage with students who have served, by making his presence known, being approachable and making these students feel welcome in the Enrollment Services office. Michael has also helped employees who are veterans transition from being a student to a college employee. Scott has been a strong advocate of Credit for Prior Learning and ensuring veterans are awarded credit for their military experience. Scott spearheaded the creation of the Technical Management degree with veterans in mind so they could gain up to 40 credits toward the degree for their military experience. Scott’s students who are veterans say that he is understanding their needs and what they are going through. He always has their best interests in mind, and goes above and beyond to support their success inside and outside of the classroom. Read Scott’s full bio. Anne’s brother served in the U.S. Marine Corps for 20 years serving two tours of duty in Iraq and one in Afghanistan. Anne is the administrative champion on campus for veterans. The increase in focus on veteran’s services and initiatives in recent years on campus is due to Anne’s dedication to serve our student-veteran population. Anne wrote the Title III Grant which provides funding for staff positions focused on increasing usage of credit for prior learning and supports the success of adult learners and veterans. Anne was also the principle administrative ally who advocated for a larger veteran’s center space to ensure veterans’ needs were met. The number of visits to center have tripled since moving to the new location. Brett has connected with countless veterans through his classes and has remained in close contact with some long after graduation. Brett ensures that student-veterans in his classes know where to get support. During his classes, he lets his students know that there is a veteran’s center on campus, that his door is always open, and if he doesn’t know the answer to a question a veteran has, he will find out it. As Lions Club Advisor, Brett has supported and coordinated campus-wide events on PTSD and suicide awareness. Brett’s students see him as an advocate for veterans. When one of his students told him she was having issues with the VA, Brett connected her to Veterans Affairs staff on campus who were able to help get her the answers she needed. Read Brett’s full bio. Nicole’s father served in the U.S. Navy. In 2009, Nicole began collaborating with the campus community as well as the City of Rosemount to come up with a plan to serve veterans, current military and their family members. The result of her efforts paid off and in 2010 DCTC became the first campus in the metro area to earn the proclamation of a Beyond The Yellow Ribbon Campus. Nicole continued supporting the Beyond The Yellow Ribbon initiative by attending Minnesota State Conferences where she was able to share best practices on how to become a Beyond the Yellow Ribbon Campus. 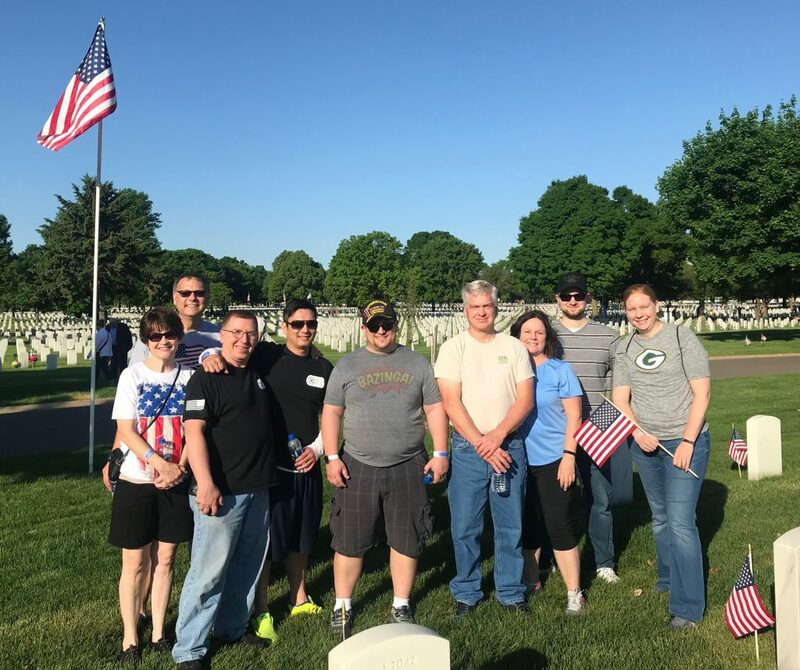 Nicole continues to support veterans, current military and their family members by volunteering in her spare time for Flags for Fort Snelling, assisting Rosemount Yellow Ribbon, and packing back packs for children of service members. Read Nicole’s full bio. Anna's brother served in the MN Army National Guard serving a tour of duty in Iraq, and her grandfathers served in the Army and Air Force serving in WWII and the Korean War, respectively. Anna has served as Chair of the Beyond The Yellow Ribbon Committee since 2016 and has done an exceptional job moving initiatives forward in support of our student veterans and their families, including implementing the DCTC Challenge Coin for student-veteran graduates, faculty, and staff; adding campus signage about the BTYR designation and reserved parking spaced for veterans; and planning a veterans orientation welcome event for incoming veterans. Anna has implemented a continuous improvement process for Beyond the Yellow Ribbon committee initiatives and goals to focus on quality, and worked with the campus’s Institutional Research department to create a military-specific program evaluation to help improve programming. With her leadership DCTC has risen to #6 in the nation and #1 in Minnesota as the best technical college for veterans (as of 2018), according to Military Times Magazine. Read Anna’s full bio. DCTC conducts an annual veteran satisfaction survey to learn how we can better support veterans on campus. Starting college as a veteran can at times be complex and often requires some time for adjustment. Connecting with other veterans on campus can help overcome the stress and challenges of this transition. 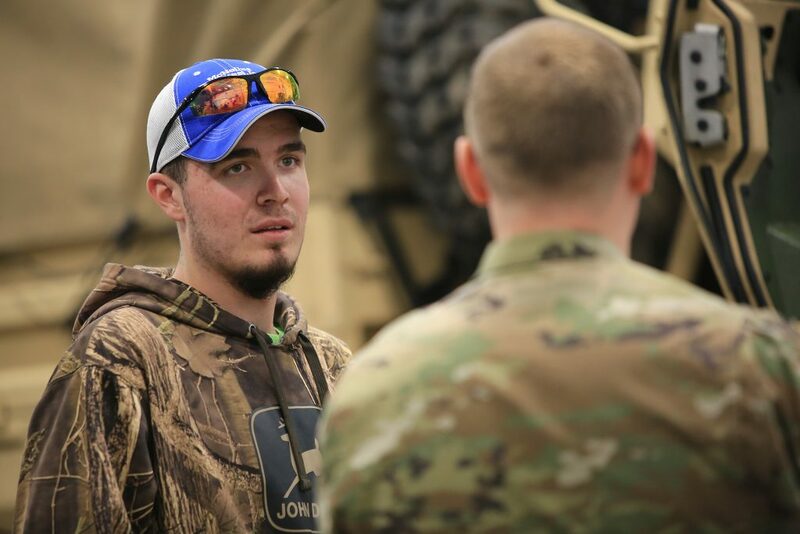 We offer student veterans opportunities to meet other veterans on campus and join together for camaraderie and peer support through the Veterans Club. Students interested in joining can submit a Student Life Interest Form or contact the club advisor.